A little over a year ago, I moved from Gurgaon to Goa. It wasn’t a considered and thought-out move. Life in Gurgaon had become so intensely chaotic that, there wasn’t room for such clarity. I just knew that I was living on a very precarious precipice and feelings of discontent overwhelmed. It was, as if, in acknowledgement of these, that circumstance stepped in. 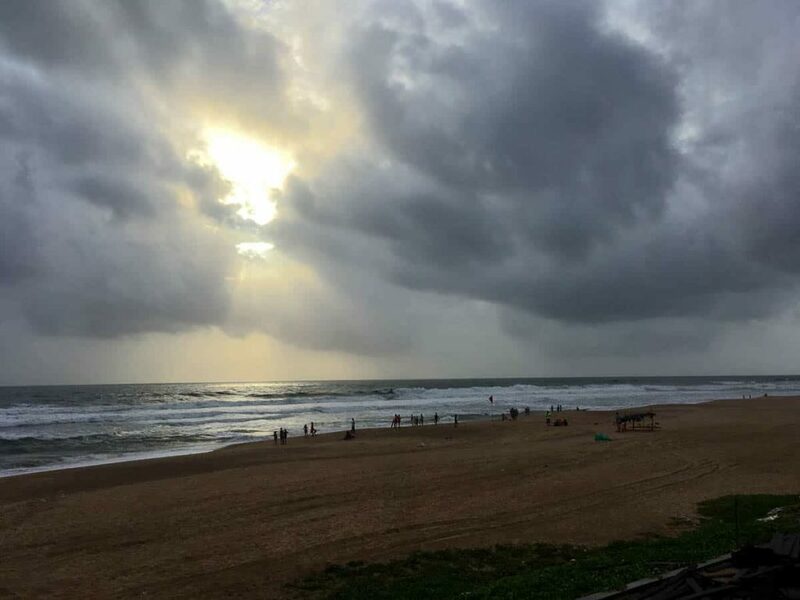 And, within weeks of a month-long holiday in Goa, I returned to Gurgaon to pack up and set up home along the coast that lines the Arabian Sea, and waters enjoining the Indian Ocean. 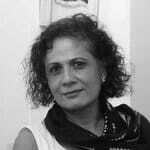 I had been birthed into being fifty-nine years ago, in Bombay, just a little further up, along the same coastal belt. 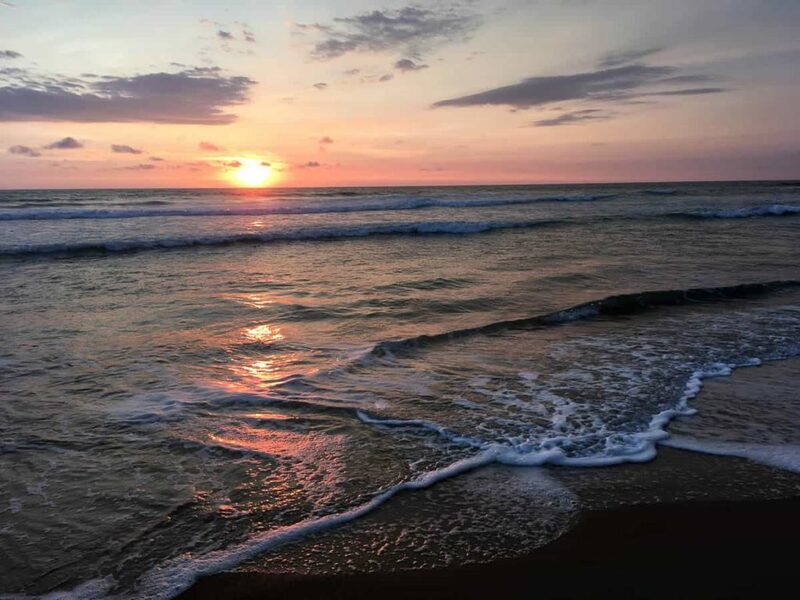 It therefore seemed befitting to return, re-order and synchronise the rhythm within, to hum in consonance with the harmony of the rising and falling crests of the ocean. But, because the move had been so sudden and swift, I often felt unnerved by it all. 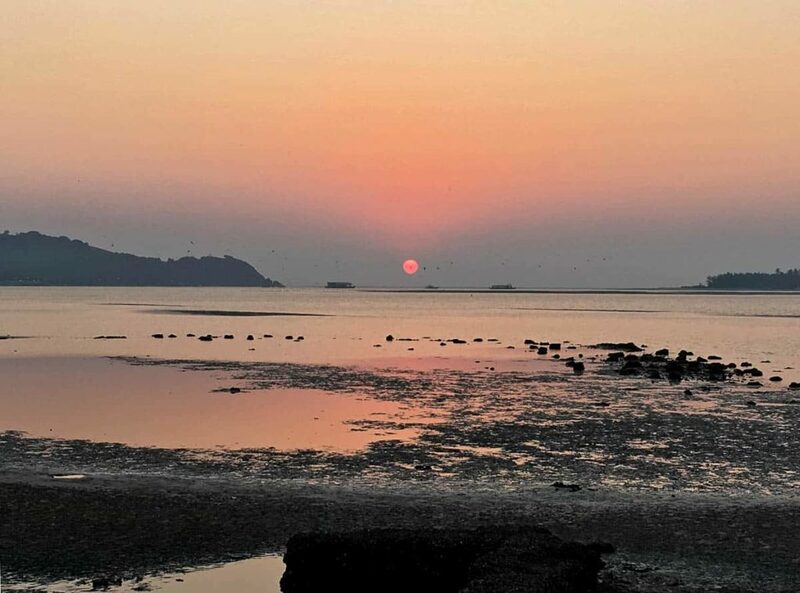 One evening, during my walk along Sinquerim Beach, in North Goa, I stretched out my arms and asked of the oceanic soul, what she intended in calling me back to her. I needed some purpose and direction to my life here and uncanny as it may seem, the waves of the mighty depths, did indeed speak to me. Ambling along in the spirit of surrender, I picked up a pebble, wet from the receding tide that had spilt over it. The hard surface was smooth to touch and coloured a dark ebony, hiding its flaws. A few steps further, I spied another, only this time it had evident ridges and wasn’t quite as black as the earlier one. On and on, I stepped, stooped and picked, returning home with a bagful. Disinfecting and cleaning them, I touched each one, felt its contours, edges smooth or rough and noted the various hues. When it struck me that every stone has a story to tell. This idea fascinated. Where did they come from, what had carried which and from where and how much of what I was holding in the palm of my hand was part of a larger entity. And, who among the bucketful in the kitchen sink, were siblings of this larger mass, and what had that looked like. It was going to be impossible to get all these details, but I allowed myself to go along with this flow of ideas. Gradually, just collecting wasn’t enough and I wanted to do something with them. I was attuned to embroidering, but the material at hand seemed too awkward for needle and thread to embellish in any meaningful way. Someone suggested crochet. I looked up what could be done and decided that I wanted to learn this technique. Within six days I had got the rudiments of it, enough, to dress my first stone. It was such a triumph that I began more complicated things. Where earlier I felt lost and confused by the gigantic move and change in the physical location of my living space, my sunset, seaside walks now had a definitive purpose. As the anthology of cobbles grew, I also became interested in sea-shells. I looked for those that were whole and complete. Gathering them in all sizes, leaving behind the broken ones. Until one day, I asked myself why they weren’t worthy of my attention. Considering that, perhaps, I was wanting to disown the brokenness in me, I picked up a few. 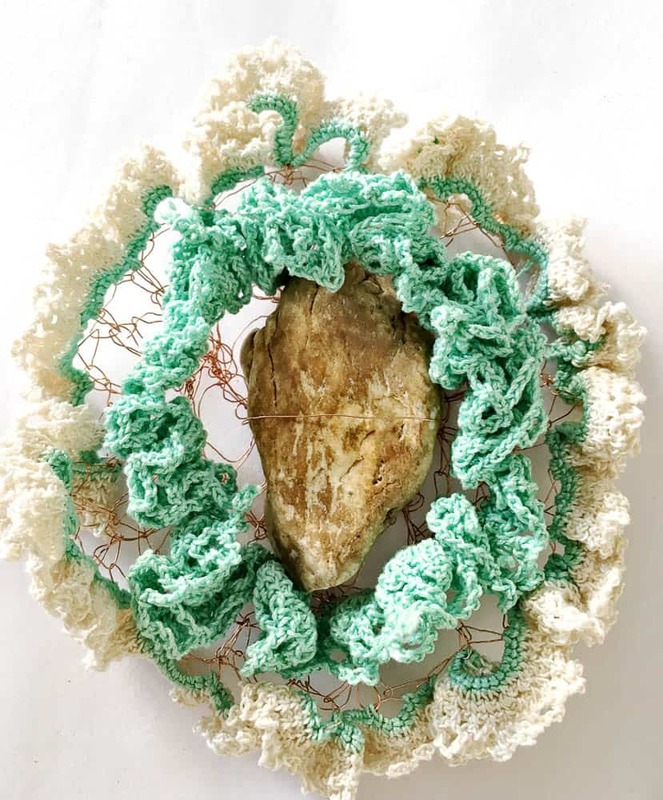 And when I started crocheting the shellac fish-casings, it was this very incompleteness—the holes and crevices, that were used to insert the strands to create lacy patterns around the form. But my acquisition didn’t stop at pieces of the earth’s crust and fish-armour, I became more and more adventurous and picked up all manner of trash that littered the shore each day. Coconuts, pieces of driftwood, fragmented sunglasses, plastic bottles filled with sand, the odd discarded tooth-brush and lone slipper, as well as fishing net and bits of strong plastic cords used by boats. I accumulated them all, and more, wanting to try and piece together their interconnected stories. When I could house no more, I began photographing the ephemeral. Leaves and twigs, French-knot like marks made by crabs on the sand, footprints of seagulls and crows and even tracks made by human feet. 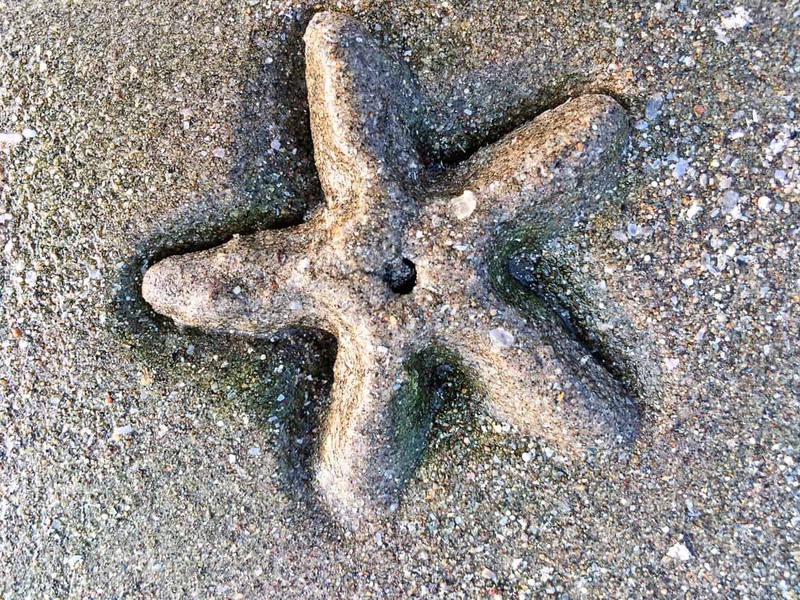 All that had made their imprint on the beaches and brought leeward by rising tides. I was fascinated by what lay on the sands and the vibrancy of life there. Where, whatever had been thrown into the aquatic deep, returned. To the same spaces or sometimes in far off places – all connected just by the water that buoyed them inland or back into her depths. The aqueous-ness that enjoins us all. 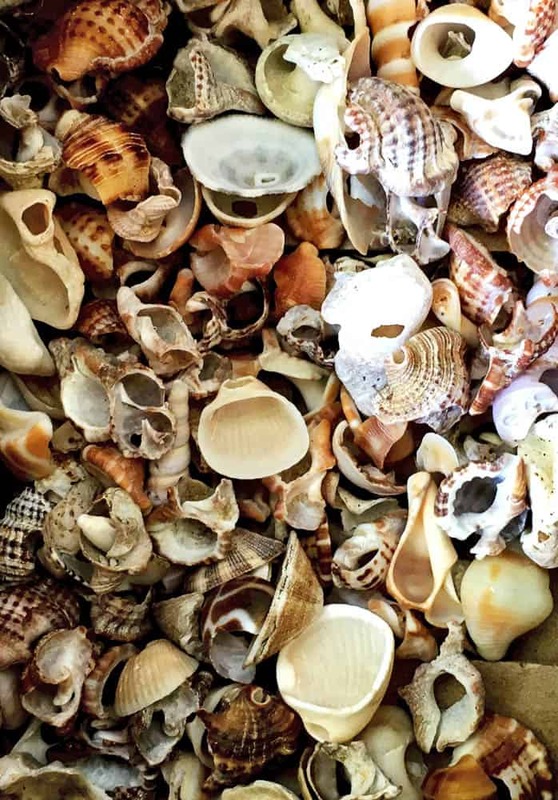 As time passed by and the concept of a body of works titled Washed Ashore evolved. To embrace, more than just the physical facets I could put into a bag and store, I started likening these to ideas that we dump into the annals of consciousness. Which, until and unless they are examined, pared down and laid to rest with cognizance, return again and again, drawing attention to themselves in myriad ways. 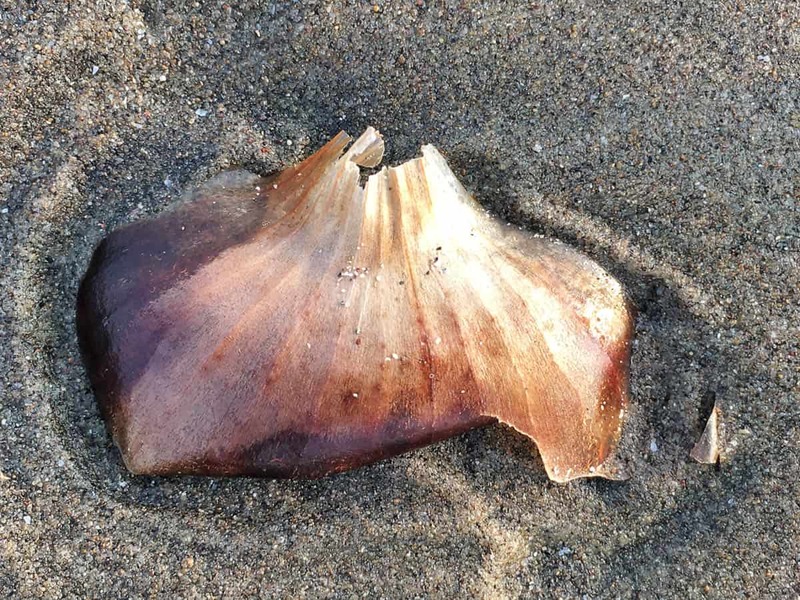 Our learned behaviour, subconscious patterns, repetitive thoughts and actions, from previous life-times or life-events, all started to emerge as ideas “washed ashore”. 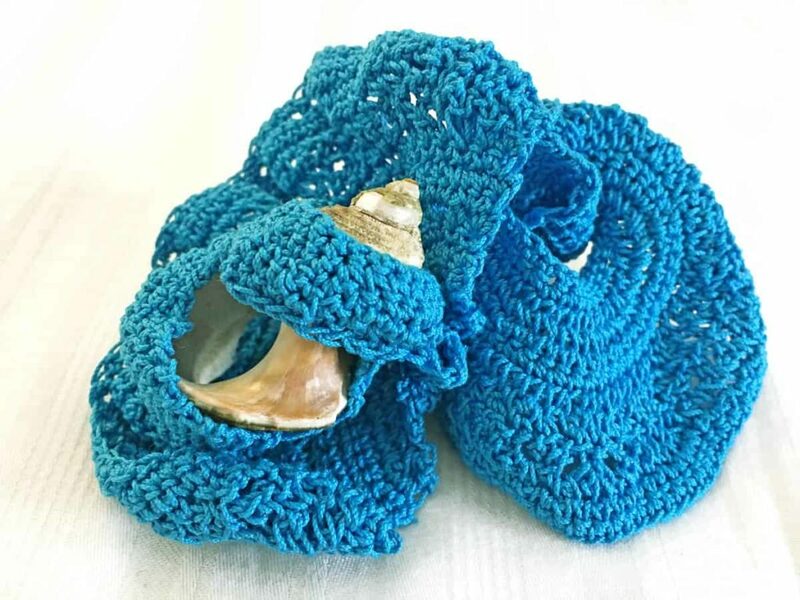 The premise was getting larger than intended so I focussed by telling stories inspired by the stones and shells I was crocheting. In the manner of looking at ideas coming into the horizon of my own consciousness. One clamshell had its centre gouged out, as if its heart was missing. I rummaged through my stash for a colour that fitted my mood and which the structure could bear. It was a fiery, bright orange that seemed to want to speak, for both of us. I had been having a difficult morning. The carpenters were still at work in my apartment. The plumber promised but hadn’t come to complete his task. My lease was to expire in twenty-five days and the thought of being homeless unless all the work was done within a week or so, was creating untold tension. I knew I should have faith in life’s unconditional support, but habitual stress tendencies were getting the better of me. I hooked the twine around and between the sides of its gouged-outness, trying to camouflage the gaping hole, at its very core. Asking myself what I’d hoped to hide. If it even needed the filler triangle which I’d made, in my distracted state. Could I protect by giving it something to camouflage the glaring emptiness? With my cloth, could I make up for the missing core? 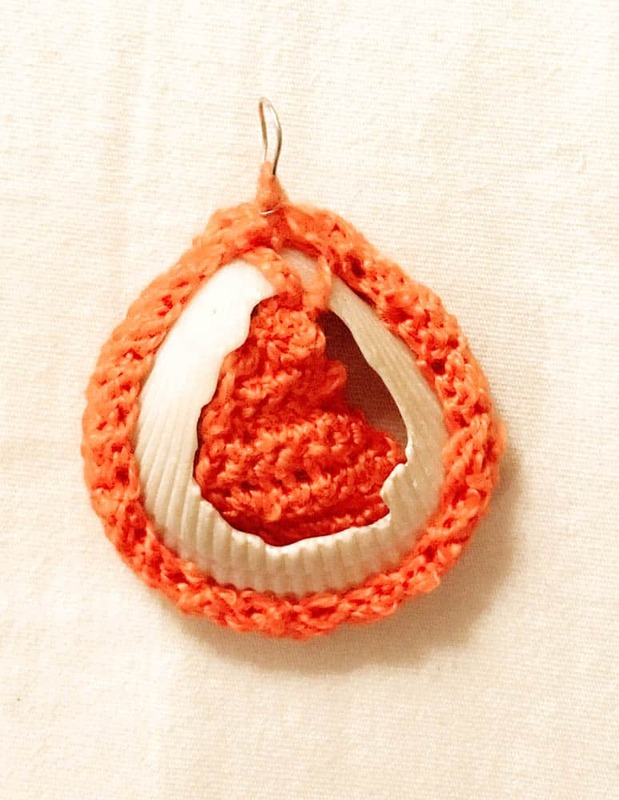 And slowly, as the shell was clad, its hole repaired without disguising its torn-out-ness, it fashioned itself into a pendant. As if to speak of all those places in memory where our hearts have been broken and never quite healed. Reminding of beauty in truthfully going over and over the stuff that seems to have been wrung out. Draping the acquired molluscs and flints, transforming them into something beyond the state they were found in, also became suggestive of the idea of covering and masking their starkness and vulnerability. This in turn, made me question why we clothe our bodies, hide our lies, our weaknesses and more. Veiled as anger, shyness, fear, depression, and almost the entire gamut of human emotions that hold us back from realising our fullest potential, ignominy has become almost fundamental to our essence. But rarely recognised as such. Like the conches, clams, crustaceans, mussels and rocks, we don’t come into the earthly realm carrying the stigma of disgrace. But, living in the world, not finding acceptance, being chided and derided, abused and ignored, humiliates us from an early age. This indignity has become subversive and many don’t even recognise the impression, often mortified of feeling shame. In The Scrunchy, the found items were left out of the initial work with 0.3mm copper wire. I let the material lead the way and the wire-work was far from finessed. Partly because of my inexperienced hands and partially because of the nature of the resource. 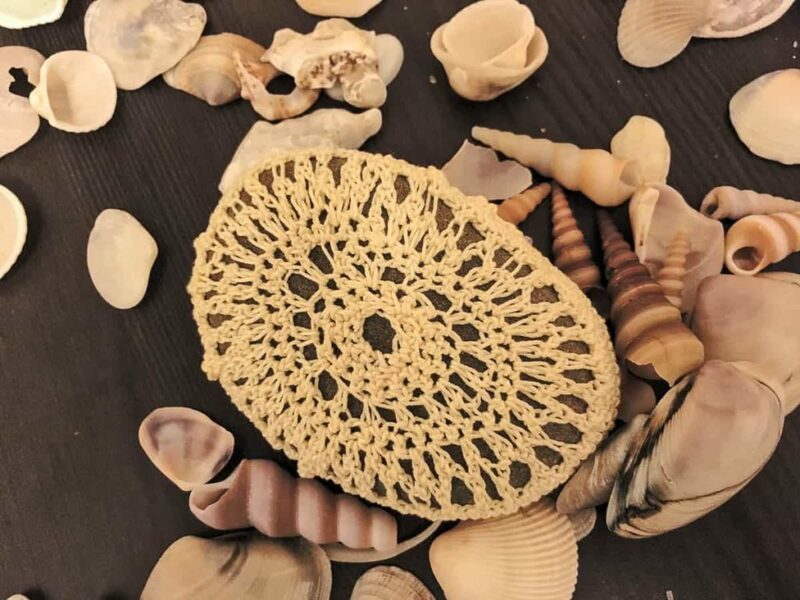 The gawky looking crochet—much as it was an achievement in my eyes, made me want to use cotton to finesse the edges. Ageing copper turns blue-green and my hands instinctively gravitated towards this hue. But then, as I worked around the wired rim, it seemed a tad too much colour. The yarn-count was thick so I wasn’t getting the delicacy of line I sought. A 30’s count off-white was perfect, except that my impatient hands couldn’t work around the copper gauge/basket-like form, fast enough. So when the time came to add another layer by puckering the copper lace, I reverted to the aquamarine hue. As I hooked wire and then string, I pondered on the mirror which this process created of the human experience. Thread is infinitely malleable. And just like the spirit of life, it’s possible to do anything with it. Wire seemed more like cognizance, which needs coaxing and coercing and a spiritual practice (whatever that may be for different folks) to keep it going. The rigour of our desires is often too much to handle, pulling us down with gravitas. And that’s what the stone placed within this quasi brain-like form, suggests to me – a mind weighed down. I think the intellect is equal to the spirit, in that it is formed off this essential component of existence but, has garnered a miserable reputation in our new age. I had decided to take the day off from house renovation matters because my psyche was heavy and laden. I interlaced the thread with copper, letting the emotion just spill out through the rhythm of hooking—no fetters, no questioning—just the mood holding sway. In not quelling the ego’s angst, it struck me that much, if not all art, poetry, music and other cerebral inventions have emerged from the solemnity of survival, and would not have come forth in a world, existing in the lightness of being. The mind had its way that day, affirming that it is misunderstood and needlessly maligned. I gifted this wire and cotton paper-weight to a friend. Suggesting that he may like to open and scrunch it, pull or push it in different ways. Working with it, as dictated by his feelings and to note the effect. Doing so, especially on a stress-filled day. 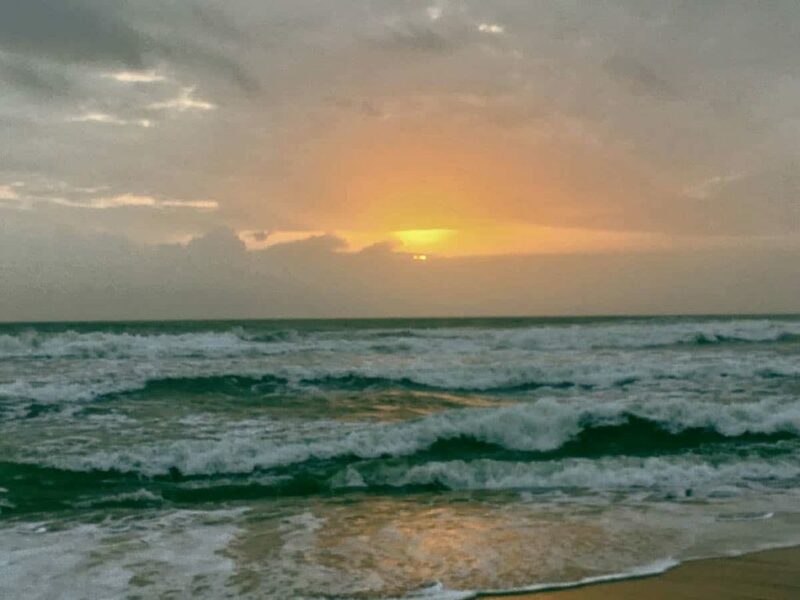 Hi Gopika, I’m struck by the flow and connect in your inner and outer worlds and your own awareness of these is fascinating to see. You are definitely on a quest and I love your spirit of enquiry leading you. There are so many other interesting interplays, we need masala chai with aqua and you. Come soon. Thank you, Jude, Selina and Mala. Each comment lends different insights to my work, which makes the sharing process so enriching. Thank you for reading and writing in.